This is the first post for 2013...so Happy New Year my readers! Happy New Dreams!! I hope this year will be better with more interesting things and moments in our lives! amazing post!love all those details! !happy new year! Χρόνια πολλά Δεσποινάκι. Καλή χρονιά εύχομαι με ό,τι μα ό,τι επιθυμείς να σου φέρει! Πολύ ωραία ιδέα για πρώτη ανάρτηση του χρόνου. Πολύ όμορφες οι επιλογές σου. Φιλάκια πολλά! Lot's of love! Happy new year! we love ripped! jeans,jackets,t shirts, all!!!!! Details can upgrade a look for sure. 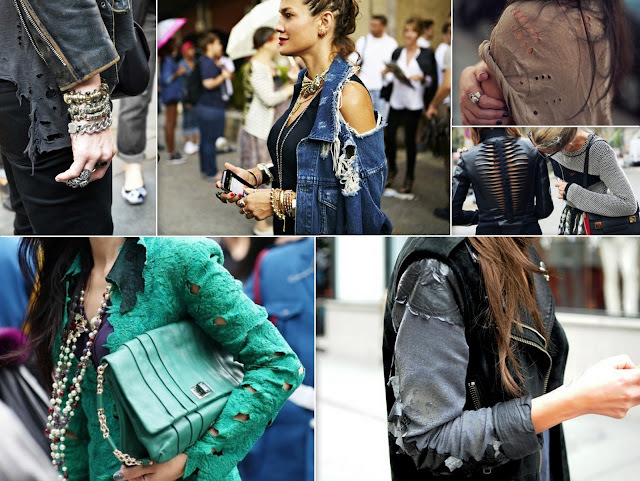 I want this ripped jean jacket. oh how pretty!! great blog! κ το κάνεις κ εύκολα μόνος σου! Love this post! :) Thanks for sharing with us:) Amazing blog you have! Let's follow each other via fb and bloglovin? Will add you back directly! they all look great! !followed you back ! !